If you’re down to get super funky (or not), the SolidGoldFX Funk-Lite is the envelope filter you’ve been looking for. Straightforward, sleekly designed, and poised to give you as much or as little filtering effect as you want, the Funk-Lite is designed to play well with both guitar and bass. Sporting easy-to-use knobs, the Funk-Lite gives you the power to change up the depth, frequency, and attack of your filtering effect. Depth affects the depth of your filter while the frequency control sets the center point of your filter sweep, and finally, the attack knob controls the sensitivity of your picking dynamic. And the icing on the cake of this simple-but-sweet pedal is the toggle switch that allows you to choose between an upsweep and a downsweep. If you’re not a one-pedal type of player, don’t worry — the Funk-Lite plays extraordinarily well with others, particularly drives. Plug in your favorite overdrive and the Funk-Lite will add a delicious mid-range boost to your tone. Even bassists can get in on the fun with the Funk-Lite. Although it won’t be quite as dynamic, the filtering can be used to subtle effect on bass to imbue your sound with just a little bit of funk. 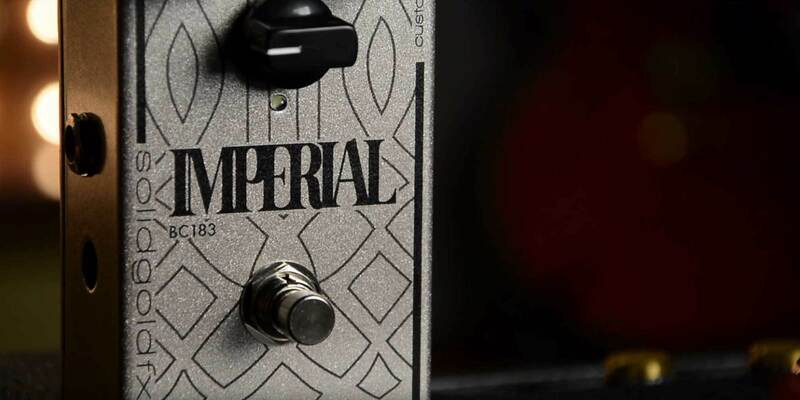 Check out our video demo of the to the SolidGoldFX Imperial BC183 Fuzz. This fuzz box is based on the classic four-stage Big Muff circuit of the '70s, but adds a few modern tricks of its own. Watch the video above to hear Joe demo the SolidGoldFX Funk-Lite envelope filter pedal, and click below to compare prices on new and used pedals for yourself.